Step 2: Schedule Meeting � Once we receive your form, the Operations Manager, Natalie Miller will contact you to schedule your initial consultation at a time convenient for you. Generally we schedule these meetings Monday through Friday between 8 am and 6:30 pm. If weekends work better with your schedule we can make these arrangements. Step 3: The Meeting � Aaron Miller, the General Contractor and Project Manager is present at all initial consultations. He will work with you throughout your entire construction process. This gives you the opportunity to meet the person in charge of overseeing your project and allows us to properly identify your needs and expectations. Your design criteria � If you have any professional drawings or your own sketch of design ideas this will help immensely. Otherwise, Aaron will discuss with you what you have in mind and get an idea of your tastes and style to establish your design criteria. Options to consider � Once Aaron has assessed your design criteria and the project�s function, he will provide you with all your different options. Material selection styles and brands � This helps us properly allocate allowances within the estimate we prepare and in turn will give you a more accurate cost of your project. Questions and concerns � If you are looking for a professional recommendation this is a good time to ask Aaron questions while he is on the site and can take measurements. Be sure to make a list prior to the meeting so nothing slips your mind. 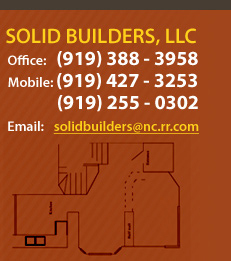 This is also a good opportunity to learn more about Solid Builders so feel free to ask any questions you have about our company and our process at this time.  Thanks so much for all your expertise and hard work in providing our screened porch. It looks wonderful and we are thrilled!